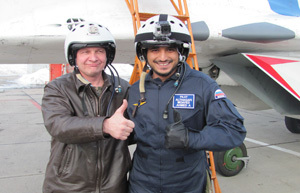 If you have seen 'Laish La' on MBC and seen Moayed fly a MIG-29 and experience breath-taking aerobatics and touch the edge of space, and you wanted the same adventure. We can help make this happen. Stay in the same 5star boutique hotel in the heart of Moscow where the 4 'Laish La' hosts stayed. Then take the fast train to Nizhniy Novgorod airbase to meet your pilot and inspect your MIG-29 military fighter jet. 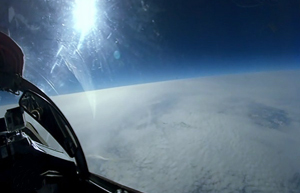 Then take a flight that will be the thrill of a lifetime where you will experience supersonic speed and break the sound barrier, as well as amazing high speed aerobatics, then climb up to a staggering 22km above sea level where you will witness the curvature of the earth and the vastness of space. All will also be captured on film for you to share with your friends and family on your return home. Once back on the ground, you will then return to Moscow to relax in this cosmopolitan city which is full of history. Enjoys its many restaurants and shopping opportunities. If you think this sounds like the kind of adventure you want then contact us.